For all my zucchini noodle friends out there, then you know that these noodles are a wonderful alternative to traditional pasta noodles. For all my friends who look at me with glazed eyes when I talk about zucchini noodles, don’t knock it ’til you’ve tried it, folks! 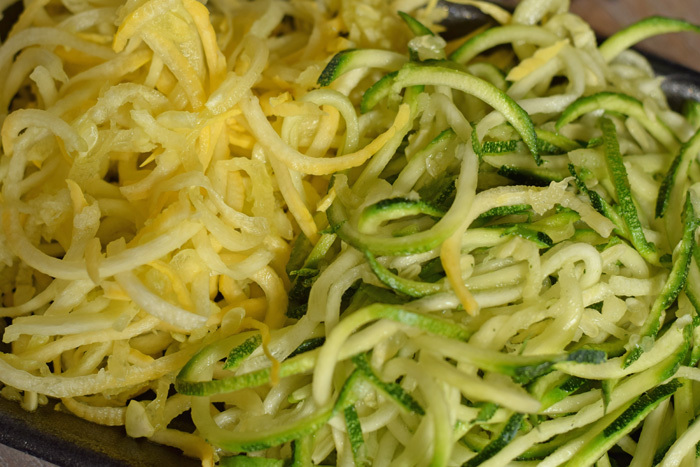 Zucchini and squash noodles have became a favorite in our house over the past year. They cook up quickly and make great lunch leftovers for the next day! 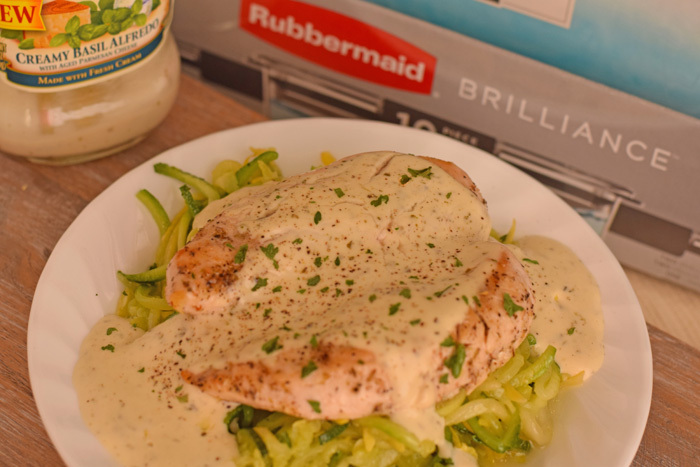 This Creamy Chicken Alfredo with Zucchini and Squash Noodles recipe is one of our favorite ways to enjoy this dish at dinner. Add one tablespoon of olive oil in a skillet. Heat. Add the zucchini and squash noodles. Cook, stirring frequently, until they are “al dente.” Remove them from the skillet and set aside. While the noodles are cooking, heat one tablespoon of olive oil in another skillet. Add the chicken tenderloins. 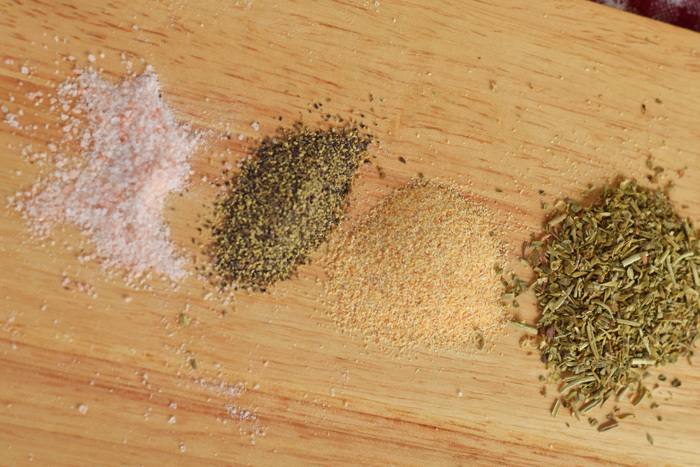 Mix the seasonings together and sprinkle them over the chicken. Cook the chicken in the skillet until it is cooked through completely. 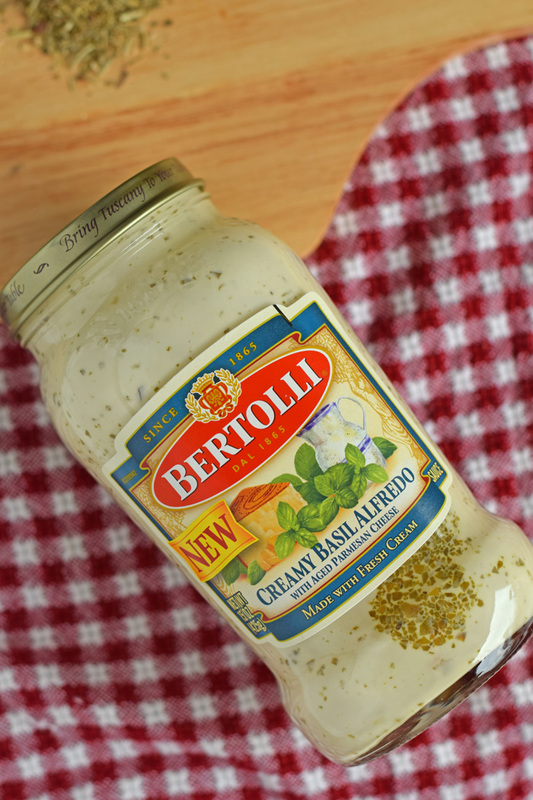 Warm the Bertolli® Creamy Basil Alfredo as directed on the back of the jar. 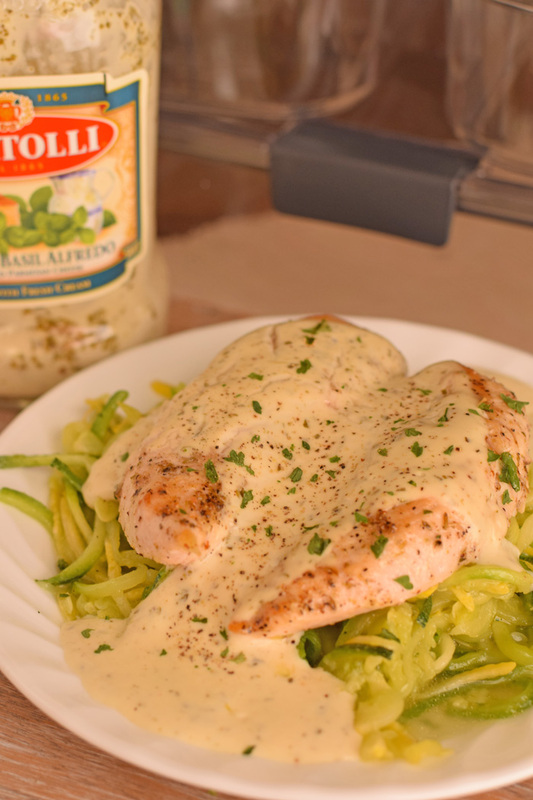 Plate the meal by adding the noodles to a dish, top with chicken, then cover with Bertolli® Creamy Basil Alfredo. One of the most common things that I hear from other moms when I talk about making zucchini noodles for my family is that they do not think that their children will eat them so why make them. I get their concern, but I also know from experience that children will never try anything that to which they are not exposed. I have four kids (which includes a set of triplets). The triplets have grown up with the exact same foods. I made the majority of their baby food. And yet they each have different food tastes. One boy likes carrots and the other two do not. Another will eat red peppers as I’m cutting them while the others won’t. I balance these taste preferences by making a few food items that are non-negotiable and giving them a choice with the others. When I make meals such as this one with the zucchini noodles, I make each portion of the dish in a separate skillet. This allows the kids to select the items that they like. I also store the items individually for leftovers. 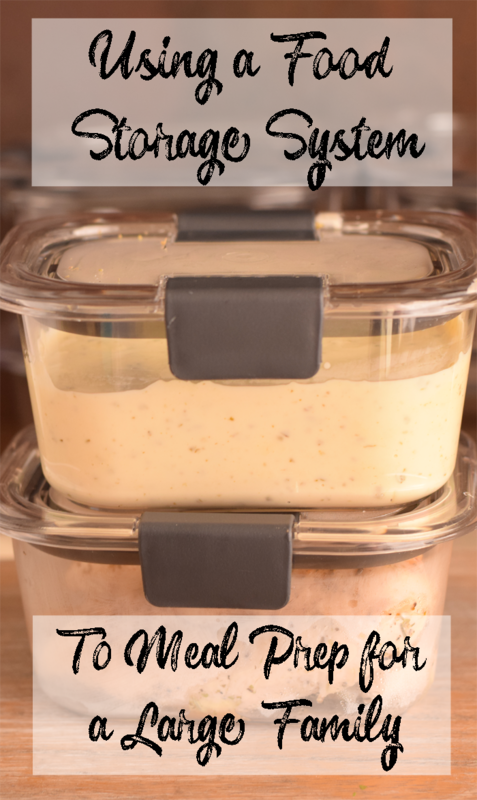 Individual containers also allows me to make certain foods, like protein, in larger quantities. 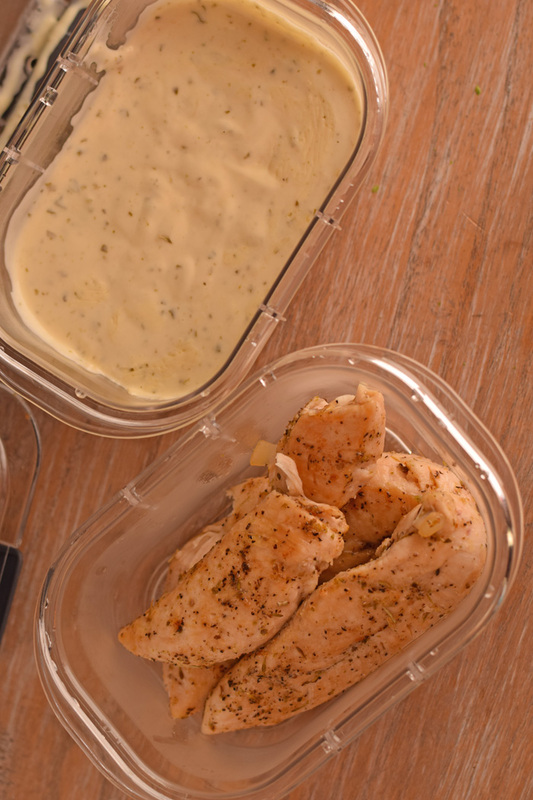 For instance, I can use the chicken in this Cream Chicken Alfredo recipe in another recipe later this week if I double or triple the amount that I cook. If you have a larger family and meal prep or if you simply like bulk cooking twice or so a week, here are a few tips. -Sit down on Saturday or Sunday and make a rough meal plan for the week. Find several recipes perfect for meal planning on this Savvy Meal Solutions site. -Cook different elements in separate skillets so that they may be easily stored. -Store each item in a different container. 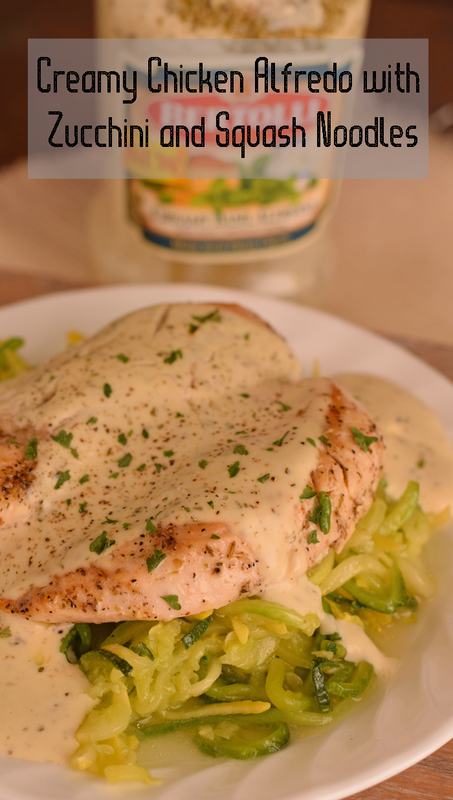 Just because you want Bertolli® Creamy Basil Alfredo sauce on your chicken tonight doesn’t mean that you will tomorrow! 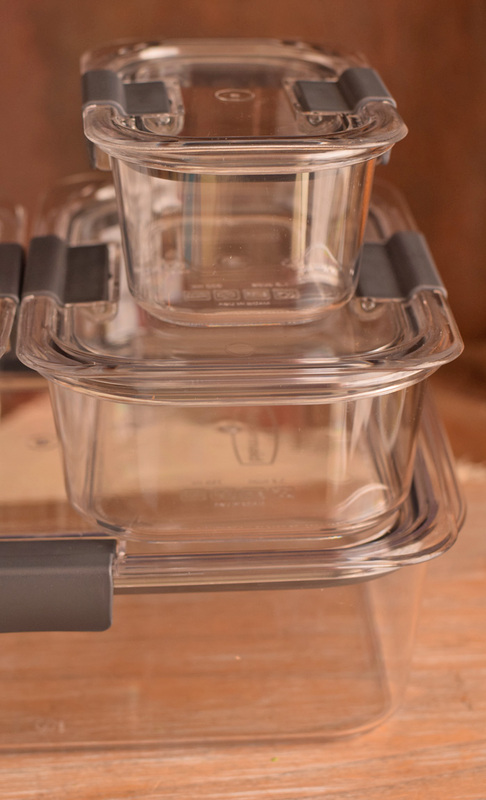 -Choose a food storage system that is 100% leak-proof guaranteed, microwave safe, stackable, stain resistant, and clear. The new Rubbermaid® Brilliance™ 10-piece set from Walmart (launched in October 2016) fits the bill on all of these elements! I have this premium set, and I like that I can place red sauce in them without worrying about the gross red stains afterwards. The clear see-through is a great feature, too. No more popping open lids in an attempt to try to figure out which food is in what container. The stacking feature equals a space saving design for my refrigerator and the cupboard. -Make protein items, such as chicken and other meats, in larger quantities. Use them throughout the week in salads, sandwiches, and other dishes. Do you use the Ibotta app? I have it and love the deals that I can get on items that I buy already! 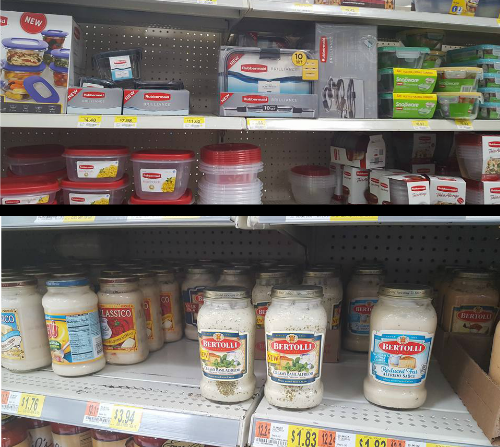 Use the Ibotta app to get $0.75 off any Bertolli pasta sauce variety at Walmart, $2.00 off a single Rubbermaid Brilliance container at Walmart, and $5.00 off the Rubbermaid Brilliance 10 piece set at Walmart. Which Cricut Access Plan Is Right for Me? I am obsessed with zoodles! This sounds so good. I know my family is going to love this. This is one delicious meal and love how you made the noodles from zucchini and we use spaghetti squash. The sauce is creamy and rich add the chicken put it over the top. Such a comfort food dish. I haven’t tried that Creamy Basil Alfredo Sauce from Bertollini. I love you recipe because you used zucchini noodles making the dish healthier than the usual pasta Alfredo. Adding this to my menu plan next week. I have been wanting to try those noodles because I am trying to do less carbs and this is the perfect way to do that without loose flavor! I have had these zucchini noodles and I very much agree that they are spectacular. I will look for this sauce which looks scrumptious actually. Also I have not seen this food storage system before but it looks really useful. I will check it out next time I am at the store. Great recipe. The chicken looks perfect and the noodles really look incredible too. I have yet to try zucchini noodles! I am not sure if I could get my boys to eat them 🙂 This recipe looks really tasty! What a great recipe! I will try this out home. Yummy! We have had to totally rethink our food storage situation. It was all mismatched and plastic. We love Rubbermaid! I really love what you’ve done with zucchini and squash noodles. My stomach is growling right now. It is almost noon.. This recipe looks so delicious! My family loves chicken and noodles so I’m sure they would love this recipe. This sounds pretty tasty. I have been wanting to try my hand at making zucchini noodles. This looks delicious! I love how easy this looks to make and know that my family would also love this too. I have never had zucchini noodles but they do sound good! 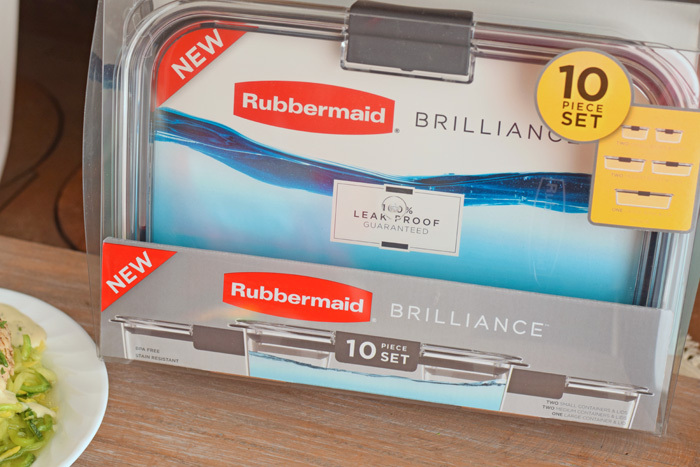 I love the Rubbermaid BRILLIANCE line. The containers are crystal clear so it’s easy to see what’s inside at a glance. Your chicken alfredo looks so delicious. I would love to try this recipe. I love pasta with alfredo. I like to keep a couple of jars on hand because they’re so convenient. Your dish looks terrific. I love using zoodles for a pasta dish. This sounds absolutely delicious and would be something I would devour. That would just be awesome for dinner tonight. 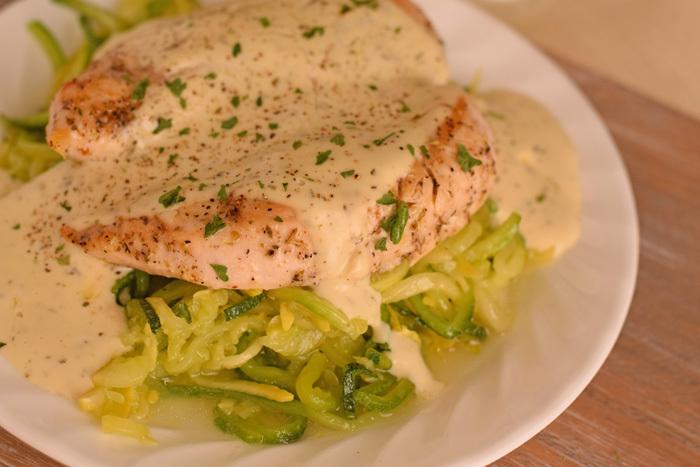 I love chicken alfredo, but adding the zucchini and squash noodles to it just makes it sound so much better. I absolutely love this recipe. Healthy and tasty. Wow, this looks so good and yes I will be creating this meal. It looks easy and very simple!